State superintendent Glenda Ritz chairs the State Board of Education, whose 10 members are appointed to four-year terms. The State Board is responsible for authorizing school funding, overseeing the statewide accountability system and intervening in struggling schools. Legislation passed in 2013 to review the Common Core State Standards and rewrite Indiana’s A-F school ratings system has heightened the profile of the State Board in recent years. Oversight of the State Board’s operations and budget used to fall to the Indiana Department of Education. But in 2013, state lawmakers decided to fund the State Board as a separate line item with an annual operating budget of $3 million. That’s led to concern that the board — largely Republican — will not continue to work with the superintendent’s office. Then, in August, Governor Mike Pence created a new state agency, the Center for Education and Career Innovation, to coordinate efforts between the State Board and other panels exploring career and technical education. The move didn’t sit well with Ritz, who says she was left out of the loop. During the CECI era, other State Board members and Ritz clashed frequently on issues such as A-F school letter grades and statewide academic standards in recent months, leading to the superintendent walking out of a meeting. 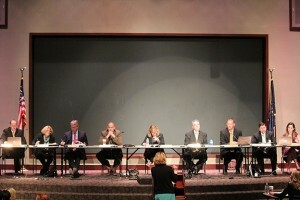 Board members also accused Ritz of not putting their items on the agenda for discussion. Ritz countered that CECI is trying to strip her of authority as the Board’s chairwoman. As a result of all the tension, Gov. Pence dissolved CECI in December 2014. 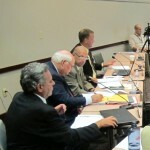 He also signaled his intent to make board reform a priority during the 2015 “education session” of the General Assembly. Lawmakers followed through on his request, in the end approving legislation that allowed them to reconstitute the board at once. Senate Bill 1 also changed how board appointments are made: the House Speaker and Senate President Pro Tem now have one appointment apiece, with the other eight falling to the governor. Eddie Melton, a manager of Federal Governmental Relations and Community Relations at the Northern Indiana Public Service Company in Merrillville, will represents the First Congressional District. He was appointed by Gov. Mike Pence in 2015. David Freitas, a professor at Indiana University South Bend who represents the Second Congressional District, was appointed by Gov. Pence in 2013. Cari Whicker, a middle school teacher in Huntington who represents the Third Congressional District, was appointed by Daniels in 2010. Sarah O’Brien, an elementary school teacher in Avon who represents the Fourth Congressional District, was reappointed by Pence in 2013. Vince Bertram, President of Project Lead The Way, represents the Fifth Congressional District. He was appointed by Pence in 2015. Gordon Hendry, a lawyer who advises public sector clients and education institutions at a real estate firm, represents the Seventh Congressional District. Pence appointed Hendry to take over David Shane’s term, which expired in 2014, and then reappointed him in early 2015. B.J. Watts, an elementary school teacher in Evansville, who represents the Eighth Congressional District, was appointed by Daniels in 2010. Lee Ann Kwiatkowski, an assistant superintendent for M.S.D. Warren Township, represents the Ninth Congressional District. Pence appointed Kwiatkowski in 2015. Byron Ernest, head of schools for charter network Hoosier Academies, does not represent a specific district. He was appointed by House Speaker Brian Bosma, R-Indianapolis, in 2015. Steve Yager, a retired superintendent from both the Northwest Allen County Schools and Southwest Allen County Schools. does not represent a specific district. He was appointed by Senate President Pro Tem David Long, R-Fort Wayne, in 2015. Lawmakers debated during discussion of a bill that would restructure the state’s diploma system and help implement new graduation pathway requirements. Gov. Eric Holcomb appointed two members to the State Board of Education, filling vacancies. One is previous board member Tony Walker. The State Board of Education voted to not go forward with a re-write of the state’s graduation requirements.